“There’s a fine line between helping and helping too much, at which point it becomes very easy for your adult child to become dependent on you and not develop the skills they need to become independent,” Christina Newberry of Vancouver says. 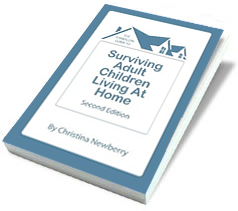 She’s the founder of AdultChildrenLivingatHome.com and author of The Hands-On Guide to Surviving Adult Children Living at Home. You can read the rest at Sun News Network. This entry was posted in Media appearances on December 19, 2014 by Christina Newberry. This entry was posted in Financial/budgeting tips, Media appearances, Planning strategies on November 11, 2014 by Christina Newberry. New research shows that in the United States, it’s not just adult children moving back into their parents’ homes. In fact, families are “doubling up” in all kinds of ways — to the tune of 663,000 in-laws and other relatives moving in with family in 2013 alone. At the same time, more “working-age, unmarried or un-partnered adults” are moving in together as roommates in order to afford their housing costs. All told, 32% of working age adults are now living in doubled-up homes of one variety or another. It’s time to work on those communication skills to ensure that all adults sharing a household have the most positive experience possible. This entry was posted in Statistics on October 18, 2014 by Christina Newberry. Would you help your adult kids with a mortgage down payment? For context, the average first home in Canada costs $316,100. That means even a 5% down payment is almost $16,000 – a tough amount for a young person to save. So, would you help your adult kids with a down payment? Would you help your kids with a down payment on a home? This entry was posted in Financial/budgeting tips on March 19, 2014 by Christina Newberry.